It is now easy to see why Symbolism was finally swept aside by the triumph of Modernism. The Great War marked such a break with the past that young people in the twenties might easily entertain the disquieting sense of living in a completely different world. A modicum of critical sense was sufficient for young people who had firsthand experience of the war to be disgusted by the propaganda of either side. And this led them to question the values that they were exhorted to defend. The First World War was experienced by the leading intellectuals of the period as the suicide of Europe. This suicide was first and foremost cultural, and it is significant that the Surrealists sought to destroy the vestiges of culture that had survived. The first notion to be discarded was that of "decadence". It had outlived its purpose. But what was to take its place? For some, the answer was "primitivism", that putative ally of progress and modernity. Like Decadence, Primitivism was a specious concept lacking serious foundation, but it carried conviction; people felt that they understood it. In 1926, when Alexander Calder first arrived in Paris, his friends hastened to explain that it was better to be a primitive than a decadent. Calder possessed a child's love of play and a thoroughly American faith in "nature"; he consequently chose to be a primitive. In practice, this meant that he did not trouble to acquire a demanding - and perhaps stifling - technique; instead, he trusted his own impulses. These were supposed to be ground-breaking, and in many cases, so it proved. Meanwhile, the theorization of the unconscious in terms of libidinal economy had occurred, and it seemed likely that this was an ultimate truth. The atom could not be split; there was nothing beyond or behind the libido. The primary point of reference here was Freud. But there was also Nietzsche and, further afield, the Marxist notion of ideology; further afield again was the crudely articulated Darwinian concept of the struggle for life, another of the fundamental "truths" which moralising sentimentality had shielded from sight. This was one of the conclusions drawn from the savagery of the war. It was therefore necessary to unmask the contents of the unconscious and its hidden drives. 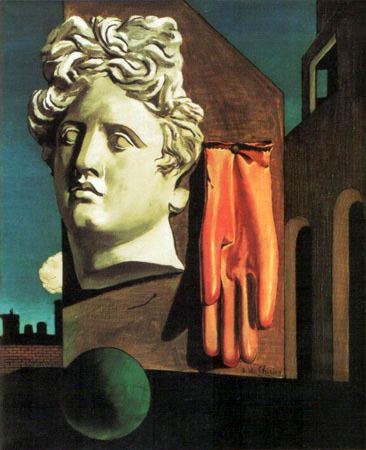 The Surrealists set about fulfilling this programme, discarding Symbolist idealisation on the way. The great political powerhouse of the time was the 1917 Revolution and the extraordinary upheavals that it had initiated. No more talk of "other worlds"; there was a new world to create. Art must henceforth serve a social purpose (we remember Odilon Redon's revulsion from this idea). Without troubling themselves about the nature of artistic creation, intellects argued at length over the form in which the artist should serve society. Symbolism was tainted with the image of des Esseintes, of the solitary artist indulging in sterile and private experiments. In the Soviet Union, Stalin imposed his own brutal, elementary solution to the problem. These were some of the reasons, good and bad, that led to the rejection of all things Symbolist. Each generation makes its selection. Many artists fell into oblivion, some of them deservedly; others were recategorised. Gauguin, for instance, one day ceased to be a Symbolist and became something more acceptable: a "primitive". Had he not proclaimed himself a savage? Why take the trouble to find out what he meant by the word when it seemed so obvious that he sought the substratum of authenticity in man? But was it so obvious? It seems likely that Gauguin was referring with painful nostalgia to the only truly savage period in life, that of early childhood. Gauguin was brought up in Peru, and when he left the country at the age of seven, he experienced his departure as a tragic, irreversible exile. Artists of more radical temper sought to bring an end to the conventional discourse of art; they hailed the death of art. In France, Marcel Duchamp and Francis Picabia ("Where is modern art going? To the shithouse!") were of this tendency. Even before the First World War, the Futurists had attempted to break with the past. These provocative and hyperbolic procedures were necessary, particulary in Italy, if contemporary mentalities were not to stand in their way. (Spain's turn came much later, with Bufiuel and Dalf.) Machines were the Futurist theme par excellence, but a fascination with machines and, above all, with the car can also be found in the work of Picabia and Duchamp. 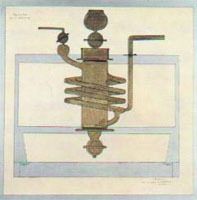 Picabia painted several works whose titles suggest that they are portraits, but which in fact represent an engine or mechanism (Star Dancer on a Transatlantic Steamer and Paroxysm of Pain). The revolutionary brilliance of Marcel Duchamp's work was widely hailed as a complete break with the past. And it was, of course, a break with facile pre-First World War aestheticism. But, pace modernist theory, one can also detect a real continuity with the past in certain aspects of his work. How could things be otherwise? Every rebellion bears the mark of the oppression which gave rise to it. 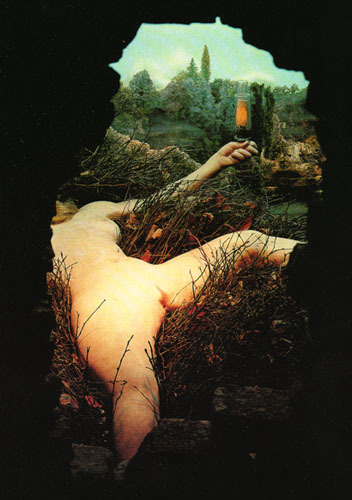 Duchamp's The Bride Stripped Bare by her Bachelors, Even (The Large Glass) and his Given. both deal with the paradigmatic Symbolist subject: Woman. But in these works she is no longer fatale, she is simply and utterly inaccessible. A new predicament is presented. Symbolist Woman was a source of anxiety because moral codes had been 'blurred'; in Duchamp's sardonic perspective, Woman is inaccessible not because the codes are uncertain, but because they have been completely rejected. This becomes clear in relation to the cardboard box (la boite verte) into which Duchamp inserted all the torn-up bits of paper on which he had noted ideas relating to The Large Glass. Duchamp's procedure constituted a cynical and mechanistic presentation of the sexual act ("As if an alien had sought to imagine this kind of operation," as Andr� Breton put it); a sexual act of which The Large Glass, in its austerity, offers no explicit narrative. By contrast, Given offers an illusionistic, three-dimensional representation of a recumbent naked woman whose legs are spread open towards the spectator. Her inaccessibility is signified by the fact that she can be seen only through two holes pierced in a barn door - which cannot be opened. The absence of all narrative content was one of the first rules of modern art, as evinced in the works of Picasso and Matisse. But like the religious or mythological art of the past, the works of Duchamp cited above do present the spectator with a complex narrative derived, in this case, not from myth or scripture but from the artist himself. Perhaps, then, Duchamp simply reversed the Symbolist values that had prevailed during his youth, substituting irony for the ideal. As Picabia's first wife, Gabrielle Buffet, reports, in 1910 Duchamp and Picabia began "an extraordinary rivalry in destructive, paradoxical statements, in blasphemy and inhumanity..." Even in the first decade of this century, they were attracted by the kind of radical cynicism whose consequences the impending war would so definitively and star-tlingly reveal. Duchamp and Picabia exposed the cynicism beneath the fine sentiments described by Thomas Mann as concealing the "individual's immense loss of value", a loss that "the war simply brought to a head, lending it concrete form and expression". To understand the energies of Futurism and the need felt by its artists to savage consecrated values, one must attempt to imagine the often stifling context of the time. 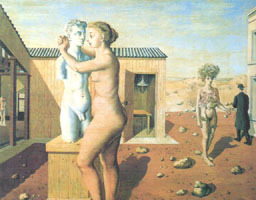 The constant transformation of people's way of life, ever faster means of communication, the development of the car ("An automobile driven at a hundred miles an hour is more beautiful than the Venus de Milo," proclaimed Marinetti, the theoretician of Futurism), made the obligation to venerate the past unendurable. And then the "Woman problem" that Symbolism so interminably ruminated on: what should be done about that? The Futurists chose to ignore the issue and proclaim their "scorn for Woman". In the same spirit they suggested filling up Venice's Grand Canal with concrete. In the early part of his career Umberto Boccioni (1882-1916) painted works whose mood was not far removed from Symbolism. 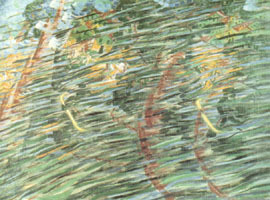 Two such are the semi-abstract paintings from States of Mind I: Those Who Leave and Those Who Stay (1911). The transition toward Futurism is apparent in the determination (present in Previati's Eroica) to escape the static model of eternal beauty and attempt to evoke movement by means other than those used by Romantics such as Delacroix. The photographic experiments of Muybridge and Marey had captured movement in process, and Duchamp and Balla had already tried to portray it. Surrealism, no less than Futurism, bears the unacknowledged imprint of Symbolism. 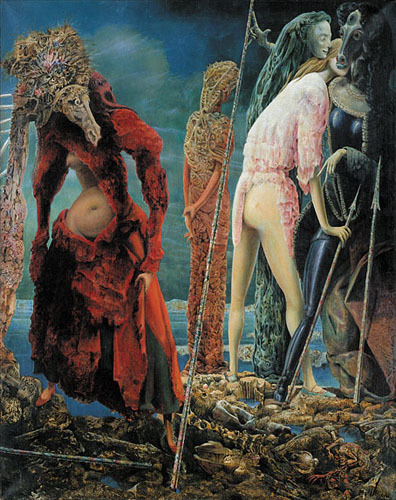 This is true not only of the "proto-surrealist" work of Giorgio di Chirico but of certain works by Max Ernst; The Clothing of the Bride (1940) has clear affinities with Gustaves Moreau. 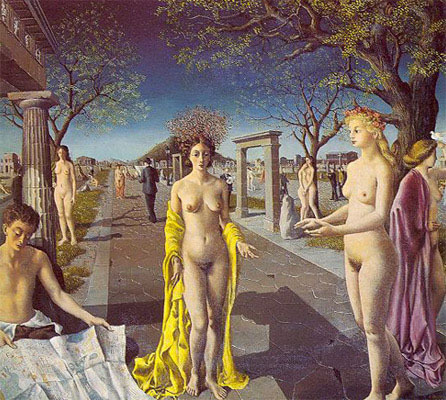 Something similar may be said of Paul Delvaux, who, though he never used the painterly equivalent of "automatic writing", is universally regarded as a Surrealist. Yet the Symbolist filiations of his work are blindingly obvious. 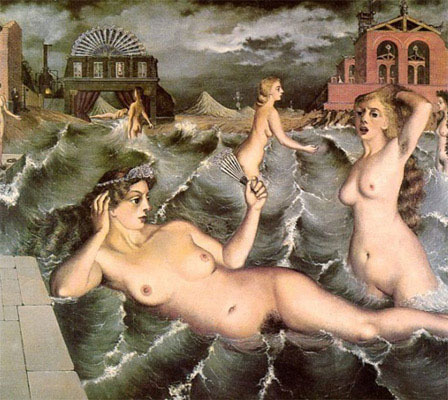 More recent artists, whose works of obsessive eroticism and cruelty display an unequivocally Symbolist heritage, are still classified, by force of habit or by sheer negligence, as late Surrealists. Finally, we should not forget that such paradigms of modernism as Picasso, Kupka, Kandinsky and Malevich at one time painted in an idiom close to Symbolism and that some of them came to abstraction by extrapolating from the Symbolist tendency towards formal simplification. Abstraction may be considered the most demanding and Neo-Platonic aspect of Symbolism. In the course of the decades that have passed since the emergence of what we term "Symbolism", new ways of perceiving and explaining the world have emerged. The inadequacies of Symbolist theory are obvious enough; the inadequacies of modernist theory have become increasingly apparent. Underlying this opposition are divergent ways of viewing the world and man's destiny in it. Each seeks to justify itself and demonstrate that its hopes or despair have solid foundations. There can be no final verdict.